Weekend Assignment #337: Lone Wolf, or Part of the Pack? Some people are happiest when they're part of a group. They may be leader of the pack, or actively contribute to the group's efforts, or simply hang out with the others for companionship, and any scraps they may get. Other people are more the lone wolf type: the explorers, the loners, given to solitary effort and independent thought. Where do you prefer to function in human society: as part of a group, or your own, or in some combination of the two? Extra Credit: Is there a group with which you're currently affiliated that is especially important to you? What is your relationship with that group? It probably won't come as a huge shock to you if I identify myself as basically an introvert, a mildly shy, socially awkward person whose emotional life is largely inside my own head. I very rarely go to any sort of party, I don't go out clubbing or drinking, and I don't currently belong to any active fan clubs or other social groups. Even the annual Doctor Who convention in Los Angeles, Gallifrey One, which I attend as often as I can, is nearly as painful to me as it is rewarding. I'm just not all that good at making social connections. My social life consists of online stuff, hanging out with my husband (mostly at home), and taking a few friends to lunch on Sundays. And yet that's not the whole story. Within my own little groups I do fine, and even tend to be the leader. At various times I've been president, vice president and editor of several different fan clubs, and my small circle of friends these days tends to follow my lead. More to the point, I have become rather deeply involved with St. Michael and All Angels Episcopal Church in recent years. I carry a torch or a crucifix in procession every week, and help to guide other acolytes through the ceremony. As church bookkeeper I interact with staff and volunteers, and attend monthly Vestry meetings. Most recently, I worked with people from the various "townships" of the church's English Faire, donating and pricing a few thousand dollars worth of junk or treasures, depending on your point of view, and helping out with a technical issue or two before retiring to my hermit cave (with the two parish administrators!) last Saturday to count the proceeds. Yet I still feel that I mostly skirt the edges of this mini-society. People know my name, but I bet half of them still think that my friend Kevin, who rides to church with me, is my husband. At Coffee Hour after church I tend to hang out with three or four particular friends, plus whoever else happens to sit at that table that week. After more than a decade attending this church, I still don't know everyone's name - but then I suppose that's a pretty high standard for a parish of about 200 people. When working as parish bookkeeper I mostly work on my own, consulting with others as needed. I'm not hopeless, though. I do know many people's names, and do manage to chat with some of them when the situation is conducive. For all that I tend to prefer my own company in the evening, to the point of being annoyed when friends call me on my cell, I'm not exactly a lone wolf. John's the lone wolf around here, believe me. He doesn't hang out with anyone except me and the dogs, ever. I don't think he's been to any sort of party in nearly a quarter century. He interacts with co-workers at work to the extent that it's necessary, but that's about it. So where does this place me in this wolf pack metaphor? I'm not exactly a lone wolf, not in the middle of the pack, and certainly not the pack leader. I'm the wolf who runs alongside the others but off to the left a bit, or slightly ahead or behind. I may even wander off to check out an interesting smell. But the pack knows I'll be back soon, and there when it counts. I had two ideas for my entry about the Round Robin Challenge: Togetherness, as suggested by Suzanne of SuzyQ421's Photo Blog. You see, this weekend is the English Faire at St. Michael and All Angels Church. I was kind of hoping to get photos of parishioners happily working together to prepare for the jumble sale, book sale, collectibles sale, children's area, Dirty Duck Pub etc. But frankly I was too busy and too stressed today, getting the rest of my own donations cataloged for tax purposes and priced for sale, to even think about taking pictures of the equally stressed people carrying all that stuff from the church office to the school gym and elsewhere. Okay, then, back to my original idea! Our dog Pepper (previous name: Lady Heather) came to us in March 2008, to help ease us through the last months of Tuffy's life. A rescue dog who was dumped by her owner for the crime of being pregnant, Pepper was initially an extremely standoffish dog. She would not obey commands, tended to get up and leave when petted, and just wanted to be left alone. 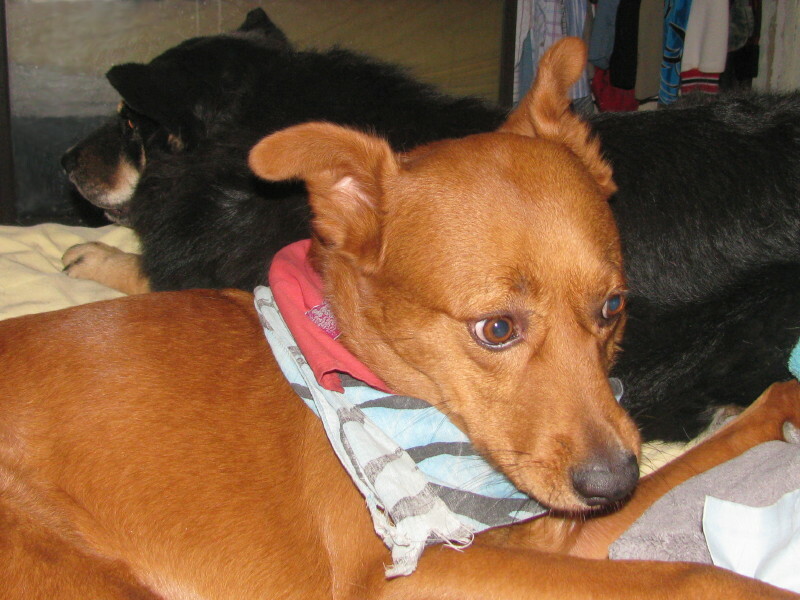 We adopted Cayenne (previous name: Ireland) on August 2, 2008, the day after Tuffy died. "Ireland" had also been dumped by a previous owner while pregnant, but temperamentally she was Pepper's opposite, a needy sweetie. 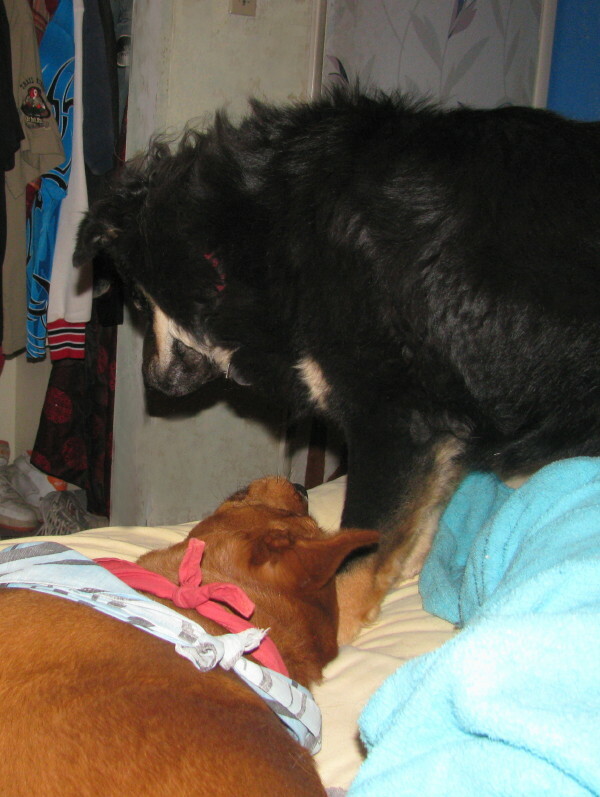 After an initial period of mutual jealousy and struggles for dominance, they became more than friends. They became sisters. 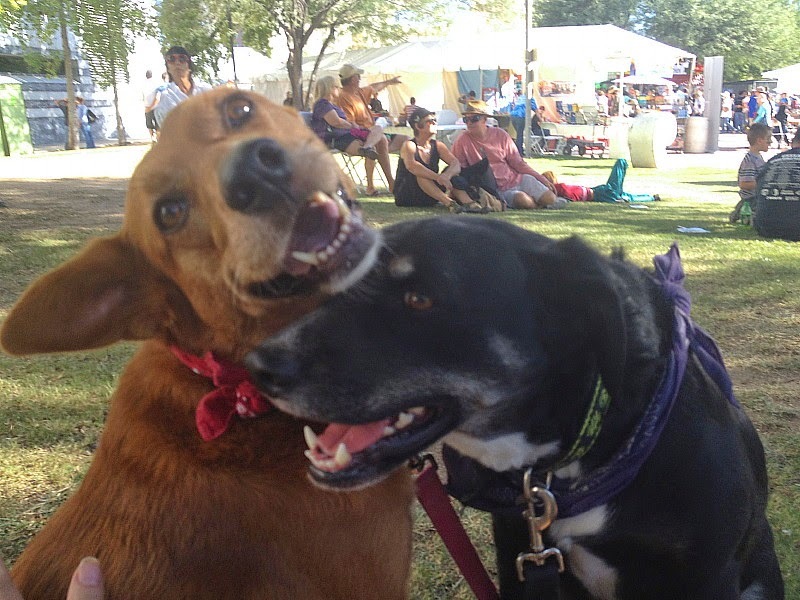 For about a year when I was entirely jobless, I took the dogs to Reid Park nearly every day. We became very close, the three of us. Pepper became much less remote and contrary. Cayenne remained needy. It's probably been a year since we've been to the dog park, but the dogs still like to hang out with me. If I'm in the bedroom, waiting on hold to file my unemployment claim (worth about $15 this week. Woo-hoo! 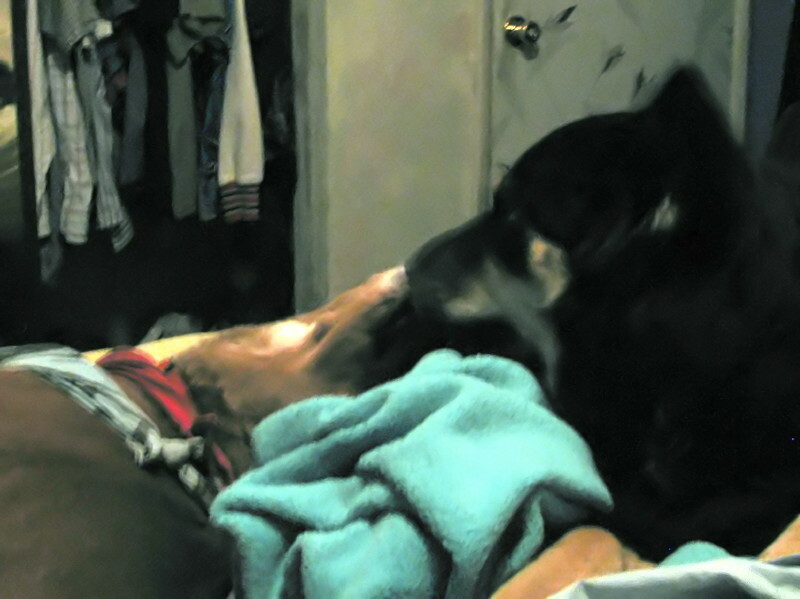 ), they want to be in the bedroom with me. If I'm watching Doctor Who in the den, Cayenne is probably on the couch beside me, Pepper on the floor. Or maybe they're both on the couch with me. If John's in the room, he takes precedence on the couch, and Pepper has to get down. And there's a thing they do, these dogs, that I've never seen from any other dogs. 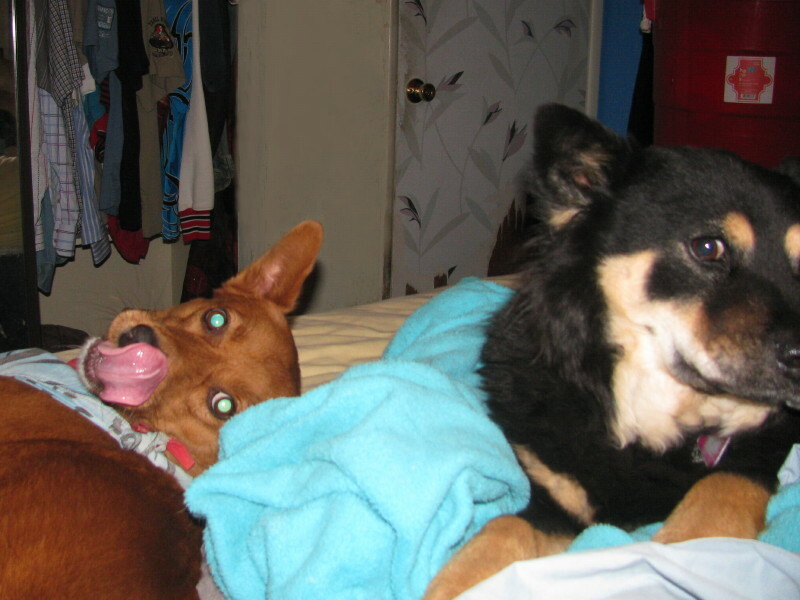 Pepper likes to lick Cayenne's face, possibility as an act of fealty, or perhaps the opposite, in an attempt to dominate and mother her. 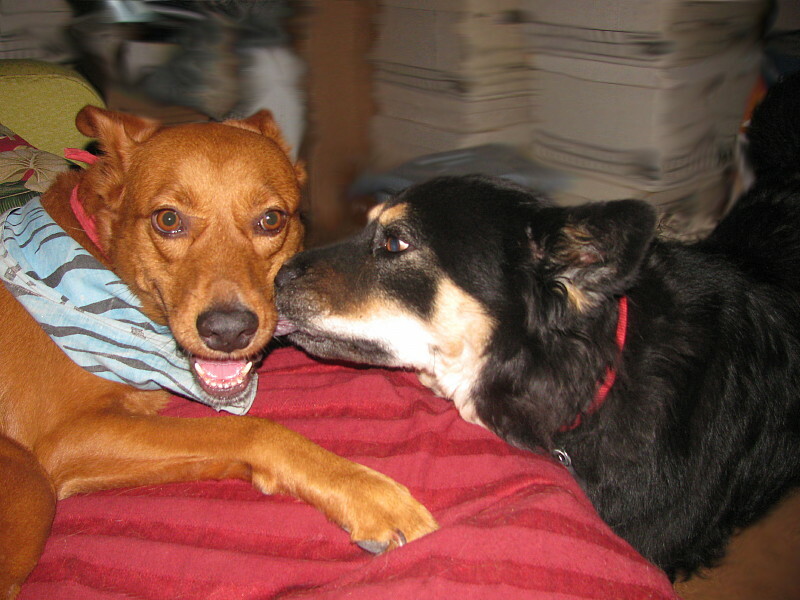 Often it becomes a kissing contest, with both dogs competing to lick each other's mouths. Cute! Now let's go see everyone else's photographic evidence of togetherness! Nathalie **Welcome, new participant! ** - Posted! mairie **Welcome, new participant! ** - Posted! Hayley **Welcome, new participant! ** - Posted! This one is based on a question posed by Michele Agnew on http://micheleagnew.com, way back in 2005. If you could have a magic button that would do one particular thing for you, up to once a day, what would that function be? Extra Credit: Would your answer to the above change if it were a person doing the task (for free and without complaint, using ordinary human abilities) rather than a magic button? For over five years now, I've coveted a button that could pause time. (The graphic above, for example, dates back to January 2005.) I'd love to hit a pause button, and have time move forward only locally around me. I would go to bed, sleep until I'm not even a little bit tired, read, take a bath, watch a DVD, eat lunch, read the email and message board stuff that was already there when time was paused, and get some serious writing done. When I had finally done all the sleeping, reading, writing, housework and hanging out that my body and mind craved, I would hit "unpause," jump back to real time without losing the benefits of my actions in "local time," and get on with my day. Imagine goofing off for ten hours, sleeping for another ten hours and still having 24 hours left for work and Facebook and television and everything else that involved interacting in real time. It would be great! I'm sure there are other people who are bored, who have nothing much to fill up their days, and would therefore find a time pause useless. I'm not one of them. The extra credit is harder for me to answer. I suppose I would have to frame it as having the ability to hire someone to do that daily task. Oh, except I said for free. Well, then, it's someone who just loves to do this task so much that she's happy to do it for free, or else loves me so much she insists on helping out in this way. Or both. At that point we're pretty much getting in the realm of housework. My all-too-mundane answer is to get the someone to wash and put away the dishes, if I can count that as one thing. Alternatively, it would be nice to have someone do the physical labor part of sorting through boxes with me, organizing the results into trash, recycling, donations and several flavors of "keep," and putting the results in the appropriate places. Yeah, that would be good. at least for now. For both weeks of this meme, which was meant to fill in for the Ellipsis Monday Photo Shoot while Carly is on hiatus, only Jama and I participated. Thanks, Jama! I may give this, or something like it, another shot later. For now, though, when I'm really busy with other things, a meme with almost no response isn''t really worth my time. Sorry! We don't all live near the site of a battlefield or other world-famous event, but any place has its own history: political, cultural, even natural history. How aware are you of the past of the town, city or state where you live now? Share with us a story of local history. The truth is that I'm drawing a blank on my original idea for this entry. Perhaps it was because I stood next to the producer of The Rachel Maddow Show on Tuesday, August 10th as he stood next to the bar at the historic Hotel Congress in downtown Tucson. 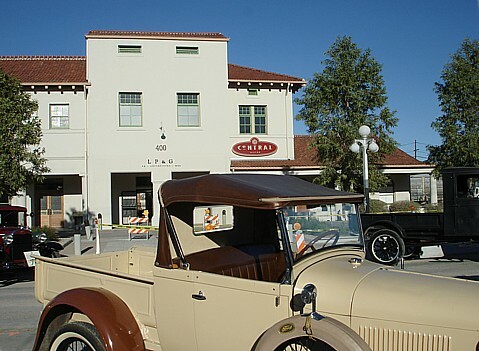 Hotel Congress is historic by virtue of its age (built in 1919 to serve people passing through the adjacent railroad depot) and relative intact-ness, but its main claim to fame in Tucson history is the fact that John Dillinger and associates stayed there shortly before Dillinger's capture in Tucson in 1934. 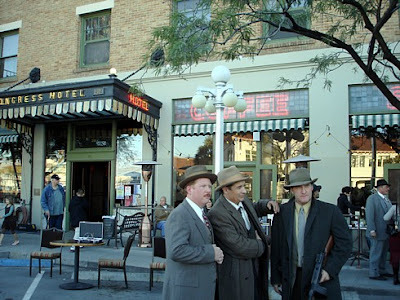 John Dillinger and associates at the Hotel Congress, January 2008. On January 22, 1934, a fire started in the hotel basement and spread upward. After John Dillinger and his gang escaped down a ladder, one of them bribed two firemen to retrieve their luggage, which included "a small arsenal and $23,816 in cash," according to the hotel website. One of the firemen later recognized the gang members in True Detective Magazine, which soon led to their capture in a private home nearby. Although Hotel Congress is also known these days for its music venue, Club Congress, for good food and for general coolness, the whole Dillinger thing is kind of a point of pride in Tucson even today, even though the legendary robber later escaped from authorities using a fake gun carved from a piece of wood. 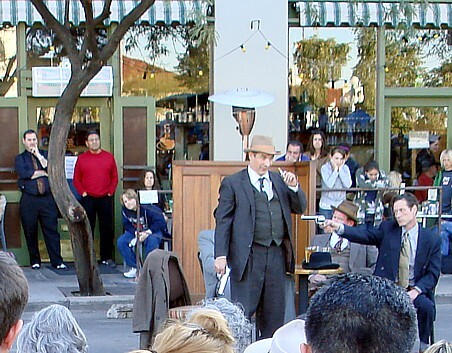 The hotel's portion of the Dillinger story is reenacted every January during John Dillinger Days. I attended one of these events in January 2008. I think that's as close as I've come to witnessing history: fictionally and after the fact. Unless, of course, voting in important national elections and then watching the results on tv counts as being a witness! I rather think not. On the other hand, John and I rode the old pre-Nemo Submarine Voyage ride the very last night of its long run at Disneyland. That counts, sort of. 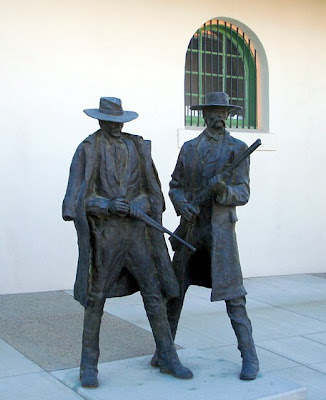 Wyatt Earp and Doc Holliday at the Historic Depot. This was just before the infamous Earp Vendetta Ride. 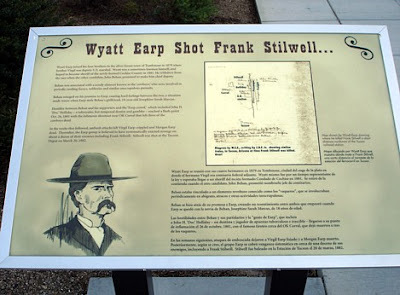 You can read more about the Earps, the Depot killing and the timeline of events here. I'm not from Tucson. I was born in Syracuse, New York, lived in DeWitt NY until I was four years old, and in Manlius NY until my parents divorced in 1976. Now that I think about my old home town, I seem to remember that maybe I intended to tell you something about Manlius history, the fact that Manlius was a major crossroads when Syracuse was a mosquito-infested swamp (at least according to one of my teachers growing up), only to lose its importance with the building of the Erie Canal nearby. But you know, Manlius history doesn't have Earp or Dillinger in it, so the heck with it. Besides, I said "where you live now," and for me that's Tucson. At various times I've also written about an historic resort in Tucson, now long gone, about Fort Lowell, the ruins of which still stand, an old warm spring spa that used to be a tourist/health destination and other snippets of Tucson history. I may now be from Tucson, but in nearly a quarter century here I've learned quite a bit about it! What do you like best about your favorite pair of shoes? instead of cheap men's shoes that wear out in a month and leave me limping. Rabbits, hares, jackalopes, Harvey... what is your preferred name for the floppy-eared creatures you encounter most often? The fluffy little animal is commonly known as Rabbit here or in my language ( Malay) as Arnab. The ones I see are mostly desert cottontails, but I quite like the name bunnies, myself! Now it's your turn. 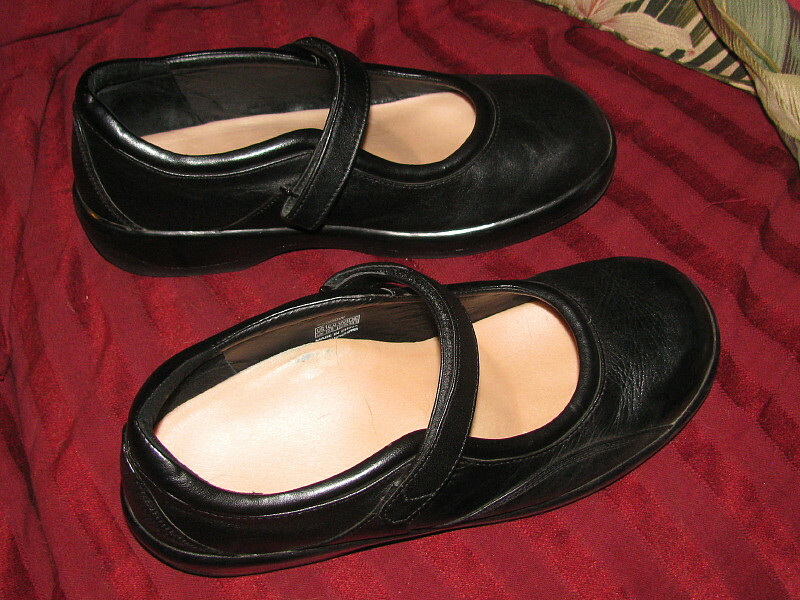 Please post your "favorite shoes" photo and one-sentence answer in your blog, and include a link back to this entry. (Anything else you put in the entry is totally up to you.) Then come back here and leave a link to your entry in the comments below. I'll be back next Monday with a roundup of responses, plus the next topic. 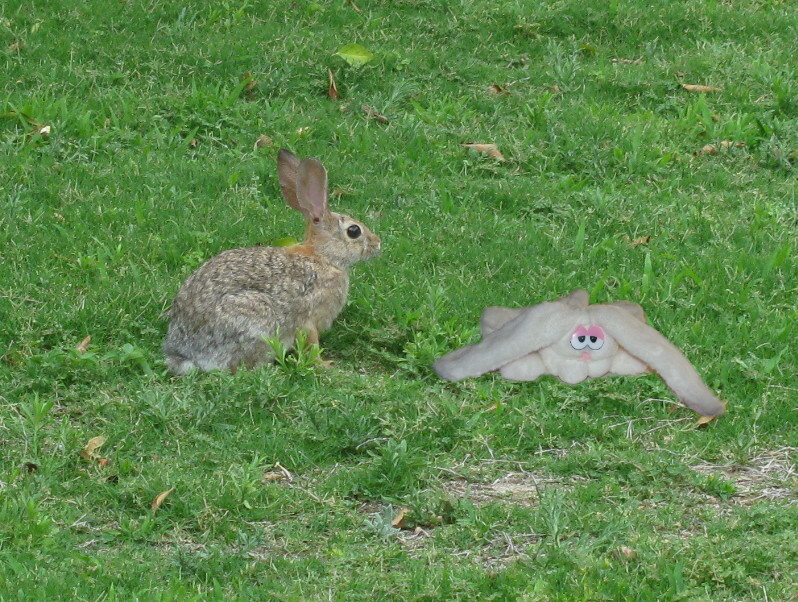 And if you missed the Bunnies, toopic, just this once I'll allow responses on that one for an extra week. Have fun! Hi, everybody! This week's Round Robin Challenge: Fenced In was suggested by Linda of Mommy's Treasures. Thanks for the great topic, Linda! 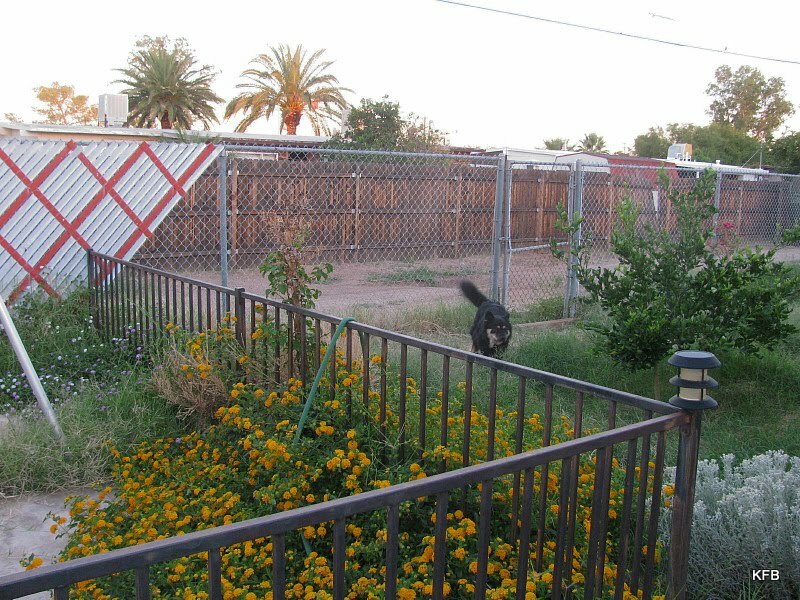 Our yard and the alley beyond are full of fences, but they tend to be more about privacy than aesthetics. Many of them function primarily to keep their dogs just out of reach of our dogs. It's a very doggy neighborhood. Our own fence, which is missing most of its slats, does not hide the fact that our lawn mower is not working right now. John is trying to repair it. Some fences are more permanent than others. A large section of the one across the alley from us fell down in a monsoon storm in June 2009. 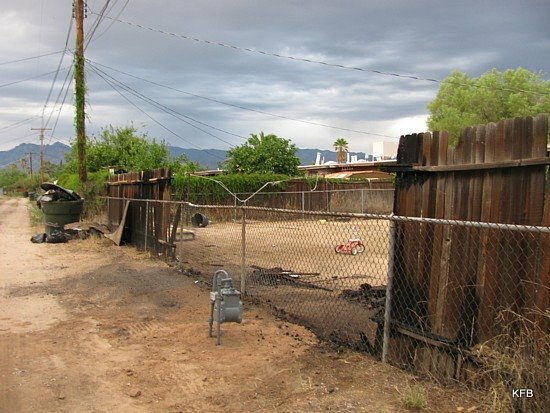 A few weeks before that, this fence up the alley from us burned in a natural gas fire. Aside from the fences in the alley, I think of fences mostly as impediments to taking pictures of the things behind them. A major example is when I go out to take pictures of the Boneyard (Aerospace Maintenance And Regeneration Center). 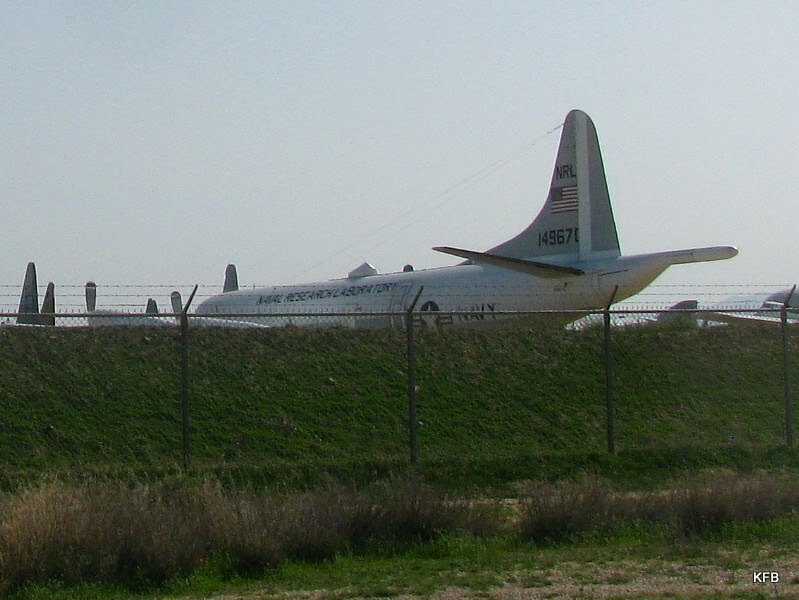 In this photo from March 2010, an aluminum slat fence gives the impression of enclosing a number of airplanes. It actually just encloses what appears to be a pipeline and fuel tank. 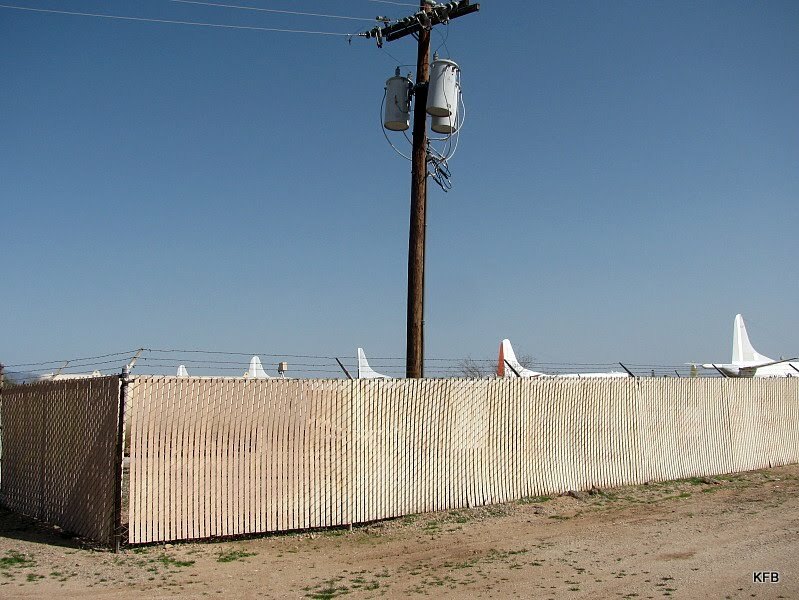 However, there are indeed fences around all the stored and derelict airplanes and helicopters. There's also a steep berm of dirt near most of the fences. This makes it impossible to get a really good view of this large and intriguing airplane, marked "Naval Research Laboratory." I wonder what research was done inside it, back in the day. Still, fences can provide a sense of security. 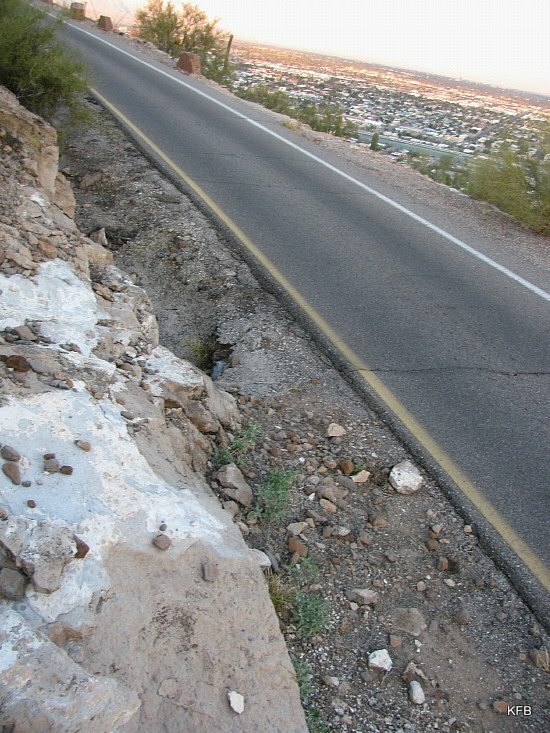 No fence on the road up Sentinel Peak means a great view but scary driving, as you can probably tell from in this January 2010 photo. 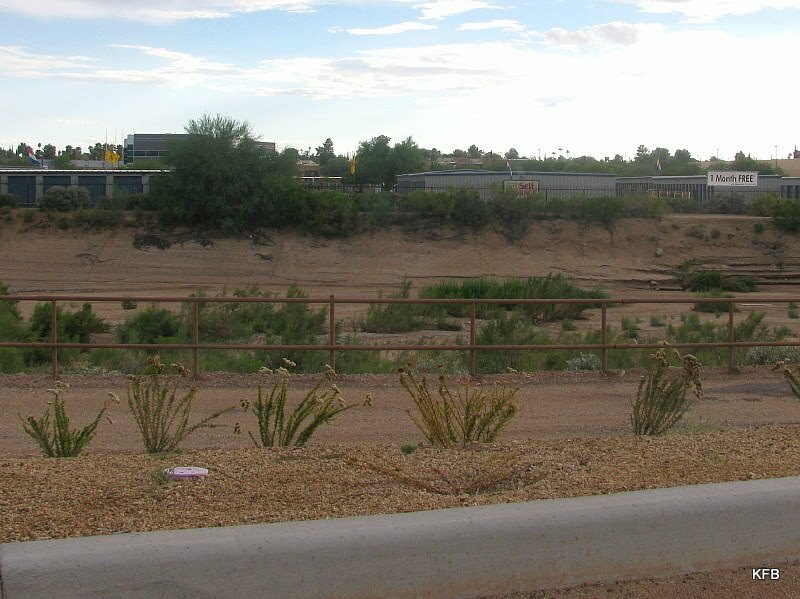 On the other hand, this metal railing type fence along the Pantano River bed probably doesn't accomplish much. You'd have to jump a curb to get anywhere near it with a car, whereas pedestrians can crawl over, under or through it easily. 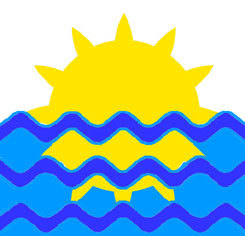 And if there were a major flood, it would not hold back the water - or the people. I could show you many more fence photos, both from today and from past attempts to photograph the things behind them. But you get the idea, so I'll stop here. Now let's go see the other Robins' photogenic fences! The idea is to post exactly one photo on the assigned topic, and to give a one-sentence answer to a related question. The first topic is Bunnies. Please check it out! Weekend Assignment #334: What Are You Looking Forward To? 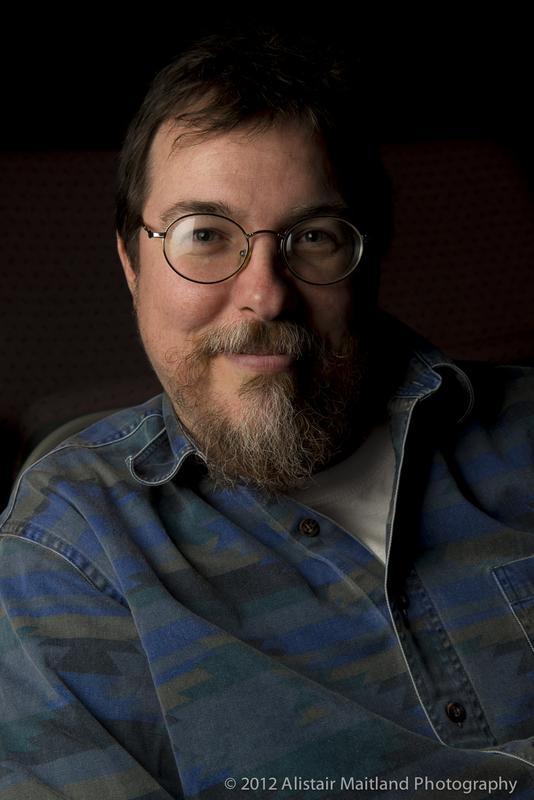 We are about to begin the last quarter of 2010, tell me what you are looking forward to. Will it be the coming holiday season? The cooler days of autumn? The kids going back to school? Family gatherings. Tell us all about it! Extra Credit: Tell us what you are least looking forward to in the upcoming months. What am I looking forward to? Umm, nothing, really, at least nothing definite. What was that quote? Every time is a time for comedy in a world of tension that would languish without it. But I cannot confine myself to lightness in a period of human life that demands light ... We all know that, as the old adage has it, "It is later than you think." ..., but I also say occasionally: "It is lighter than you think." In this light let's not look back in anger, or forward in fear, but around in awareness. I'm just trying to get by where I am now, and be prepared for whatever comes next. I'm looking forward to cooler weather, but that's at least a month off, and at least we're finally getting a little rain here and there to go with the humidity that makes it hard to breathe. I wanted a monsoon and I got it, but it's not the most productive one ever in terms of rain, and sometimes it's distinctly uncomfortable. I'd like to look forward to the day when the Democratic Congressional Campaign Committee stops waking me up every two to four weeks asking for yet another $25 donation, but I doubt that even the midterm election, for good or ill, will stop those calls. I've got a job interview next Monday, the first of three rounds for less money than I was making in 2004. Should I be looking forward to that? Last night I spent the evening pasting together every chapter of my unsold first novel, Heirs of Mâvarin, into one large document for the first time ever, reformatted it all in Courier New and started breaking my chapters into smaller size. This is all in preparation for one more revision and sending it out again, this time to a publisher that Sara G. told me about. I hate to look forward to that; I've been disappointed too many times to want to get my hopes up now. So what am I looking forward to most? Anything that pans out well, whether it's the midterm elections not going to the Republicans after all, the sale of my novel in the indefinite future, or eventual full-time employment at my former wage level. Aside from the first of these, none are likely to happen quickly. What am I looking forward to least? Continued negative outcomes on all of the above. 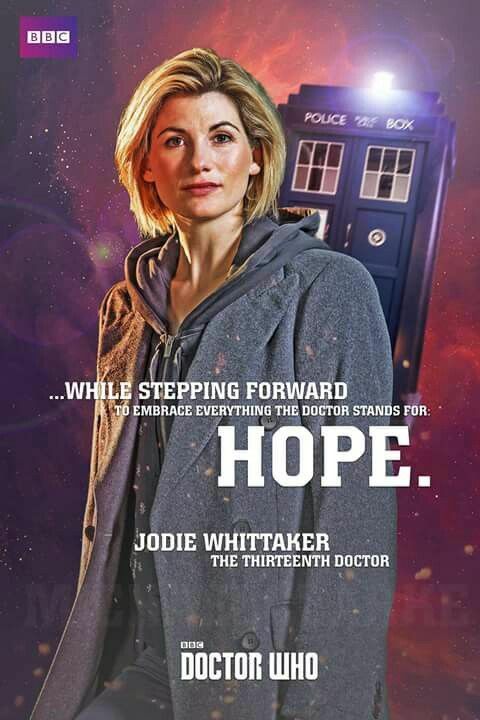 Still, I live in hope. Sort of. But here's the point of all this, which I had to finish and post this entry to find. I don't know what's coming along in the future, good or bad. Most likely, as usual, it will be some of each, along with a large helping of miscellaneous stuff, whose "goodness" depends on what I do with it and what my attitude is. But right now, I'm more interesting in the right now. Right now is not so bad. Right now I'm only working part time, but at two jobs I love and for a semi-decent wage. Right now I'm excited to be drawn back into my first novel for almost the first time since it was rejected and I learned of Tuffy's cancer on the same day three years ago. Right now I'm enjoying an all-time Doctor Who marathon, which is currently up to 1967's Tomb of the Cybermen. Right now I need to start dieting, again. Right now I need to leave for work, so I'd better stop here. But you get the idea. Why obsess about the future, when right now is pretty good, and the only part of my life I can affect directly? Karen's Quest and Question #1: Bunnies! This meme is going to be a little different, but simple enough to understand. Each Monday, I will set a one word topic, and ask a one-sentence question about that topic. Your challenge is to post one and only one photo to fit that topic, and to answer my question in one complete sentence. Ready for the first one? Now it's your turn. 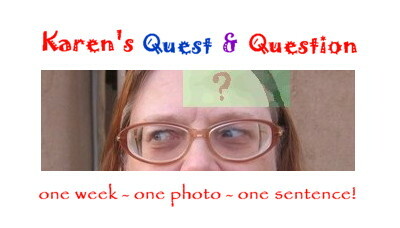 Please post your photo and one-sentence answer in your blog, and include a link back to this entry. (Anything else you put in the entry is totally up to you.) Then come back here and leave a link to your entry in the comments below. I'll be back next Monday with a roundup of responses, plus the next topic. Have fun! Do they resemble people we knew? I can't recall, can you? When Carly posted her final EMPS for 2010, Ellipsis Monday Photo Shoot #105: Nostalgia, I'm sure she was very aware that my house, Casa Blocher, the Museum of the Weird, is full of stuff that qualifies as nostalgic. But it's a word I struggle with. Many years ago, I read an article in Life Magazine about Nostalgia. According to the article, the nostalgia of the moment looked back on the 1920s. To my pre-teen sensibilities, that was too far back. Who was seriously remembering the years immediately before the Depression with first-hand fondness and longing? Still, way back in 1970, there were probably some people for whom it wasn't just an odd little fad, driven by a Broadway show or two. For that matter, who remembers 1895 London? Steven Moffat and Mark Gatiss, both Doctor Who writers, recently wrote and produced a modern day version of Sherlock for the BBC, to high ratings and much acclaim. It turns out that the characters are much more important than gaslight and hansom cabs. 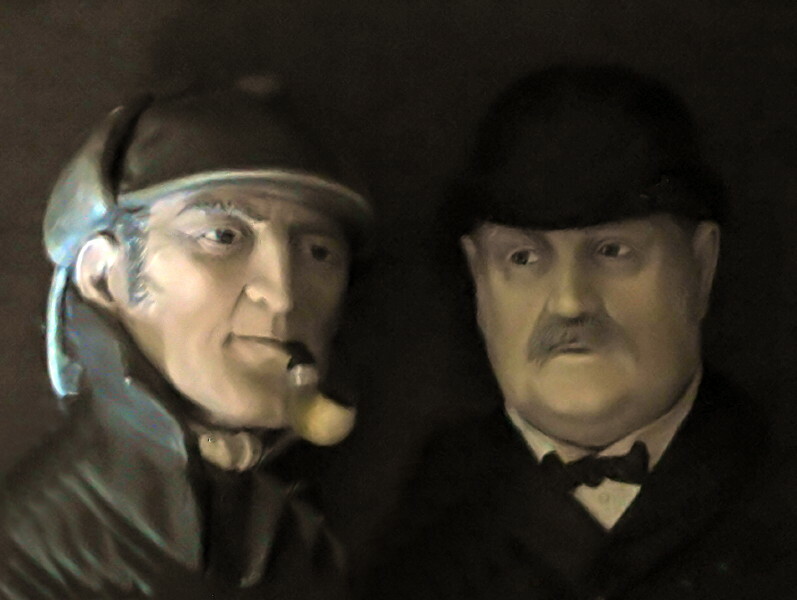 They don't have to look like Basil Rathbone and Nigel Bruce, either. For me as an adult, even the 1950s is too far back to really remember; but our house has lots of artifacts from the 1950s. Some of them are John's old toys and games. Some are vintage furniture. 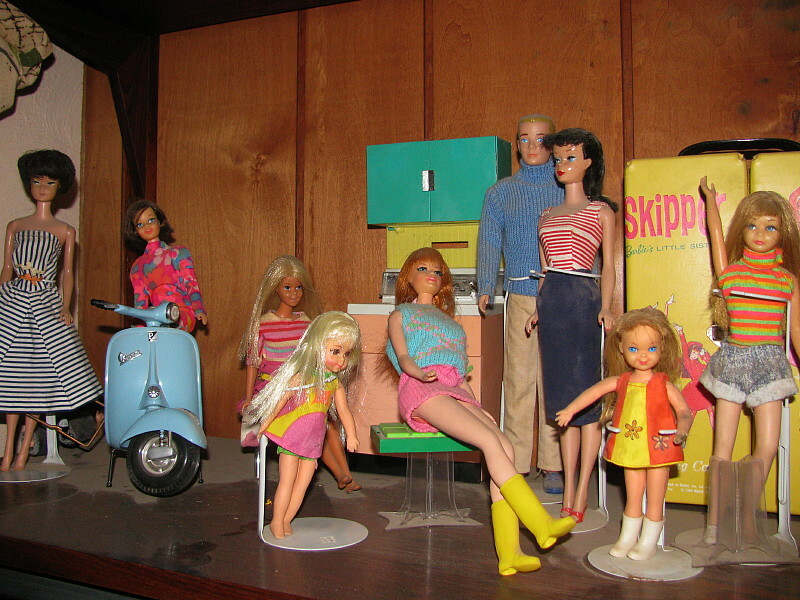 You have to get to the 1960s to start picking up on things I personally remember fondly, including Barbie and some of her friends and relatives. Sometime in the 1990s a friend of mine gave me a Tutti doll to replace the one I had circa 1966. Later I replaced my long-since-discarded Casey (Barbie's cousin's friend), my Talking Stacey (with an English accent!) and my Bubblecut Barbie (which originally came to me in a back yard trade) from eBay. Straight-Leg Skipper turned up in a local auction, and I don't honestly remember where I got some of the other Barbies I picked up in recent years. Unsurprisingly, the ones I really care about are the ones I owned personally way back when: the bubblecut Barbie, Tutti, Casey and Stacey. The last classic Mattel doll I bought was at a toy show several years ago. It doesn't seem right to have a semi-serious collection of classic and mod era Barbie dolls and not have some version of the ultimate classic Barbie design, Ponytail Barbie. Mine is a "#6 Barbie" from somewhere around 1962-4. None of my friends would have had the super-valuable 1958 dolls, so I don't need to own one now. And how much do I think about my Barbie collection? You can probably tell from the dust in the photo above. I should dust those shelves much more often than I do. Here are the upper reaches of a much more diverse exhibit at the MotW. The German sampler was done by my dad's grandmother, if I recall correctly. It's almost certainly the oldest thing in the house. I'm not nostalgic for it because I didn't grow up with it. My dad probably did, though. I display it out of love for him. The Tiki salt and pepper are 1905s and early 1960s kitsch, but I love it even though it's only vaguely from my childhood. Hawaii was a big deal when I was 4 years old, because it was a brand new state. Captain Kangaroo told me about it at the time. And Snoopy was very much a part of my childhood. Two weeks of my 25 cent allowance would buy me a Peanuts book if I could scrounge a few pennies for the sales tax. My mom was always good about that. 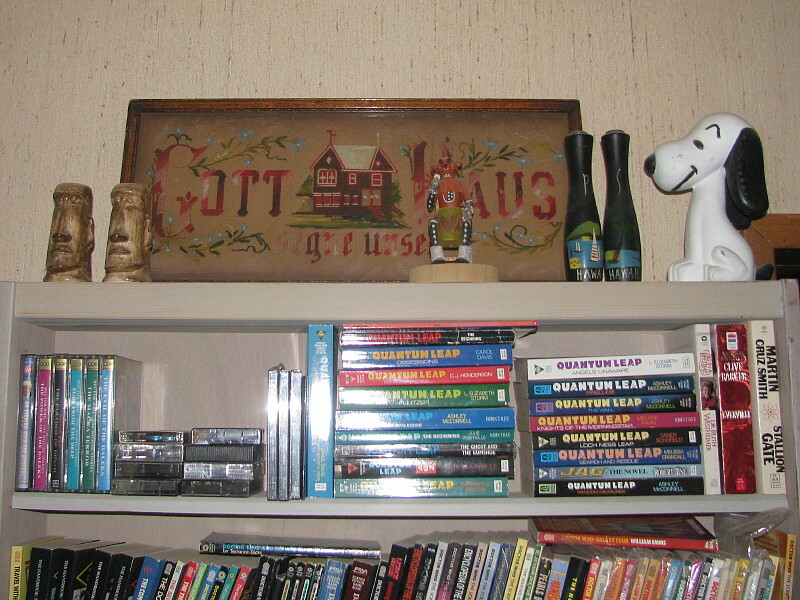 On the shelf below that stuff are my Quantum Leap books. That's a tricky one. I hated those books because they didn't follow the rules of the series very well. But I'm mildly nostalgic for the days when my friends and I were watching and taping Quantum Leap, going to California and interviewing people from the show, and putting together a fanzine about it. Not that I'd want to do all that work again, but John and I were watching Quantum Leap Season One a couple of hours ago. It still holds up as a great show. And of course there's a nostalgia factor in the premise as Sam visits past eras from 1953 to the early 1980s. (Well, once he went to the Civil War, but that was an anomaly.) There's a lot of fun to be had, laughing at Sam in his disco duds. The sheves below the Quantum Leap books hold my Doctor Who novelizations. I didn't grow up with these, but lots of British fans did. To me they're a source of nostalgia for my other major fandom of the 1990s - but not too much, because I'm at least as much into Doctor Who now as I was in 1990. Back to the toys and dolls. Most, but not all, of the stuff here is a replacement copy of something I had as a child. 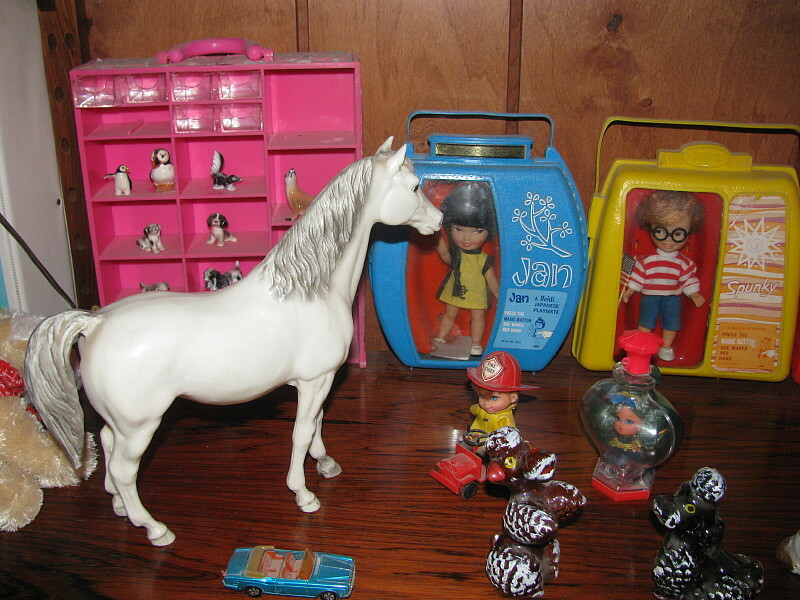 That's the exact kind of Breyer horse, and I definitely had a Jan doll (but not a Spunky), and a Bunsen Bernie Kiddle. I'm not sure about that exact Kiddle Kologne, I didn't have the brown poodle, and I'm not sure about that particular Hot Wheels car. But again, what does all this stuff mean to me now in terms of nostalgia? I am very fond of it all, but I don't think of any of it very often. Would I give any of this up, though? Some of the dolls I never had, maybe. The rest, not on your life! What's it about? Here's a teaser: one week, one photo, one sentence! Details tomorrow! 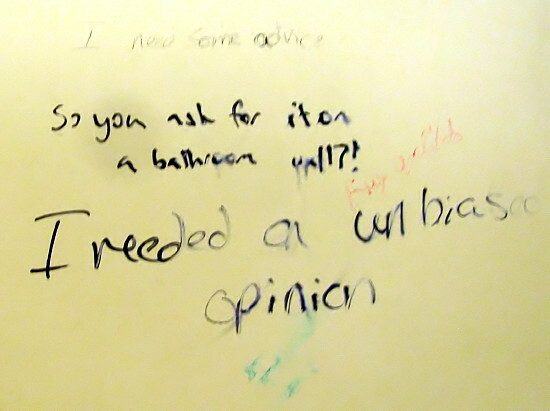 Have you ever written on a bathroom wall, or left graffiti anywhere at all? Confess! I promise we'll go easy on you! How do you feel about the ethics of graffiti, and the level of discourse sometimes found in illicit art and messages in public places? Extra Credit: If you were to leave a message to the world on a public wall, what would it be? I went back and photographed the Safeway restroom walls all over again for you, because my original photos were on my phone and I can't find the adaptor for the memory card. Darn it. "RU Born Again?" someone with a blue Sharpie asks, followed by the inevitable Bible citation. 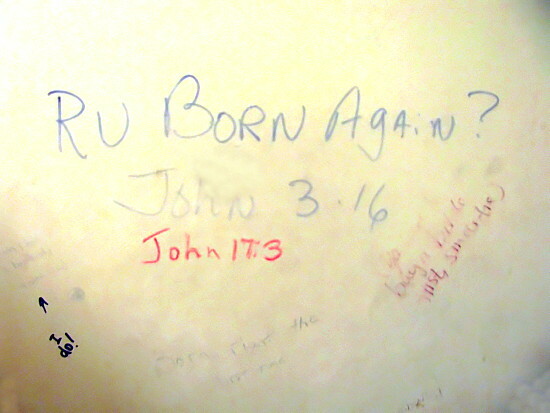 Someone with a pink marker adds a different Bible reference. "Born right the first time," someone cheekily replies. Another exchange on the same wall runs along similar lines. "Want change? Ask Jesus to come into your life." 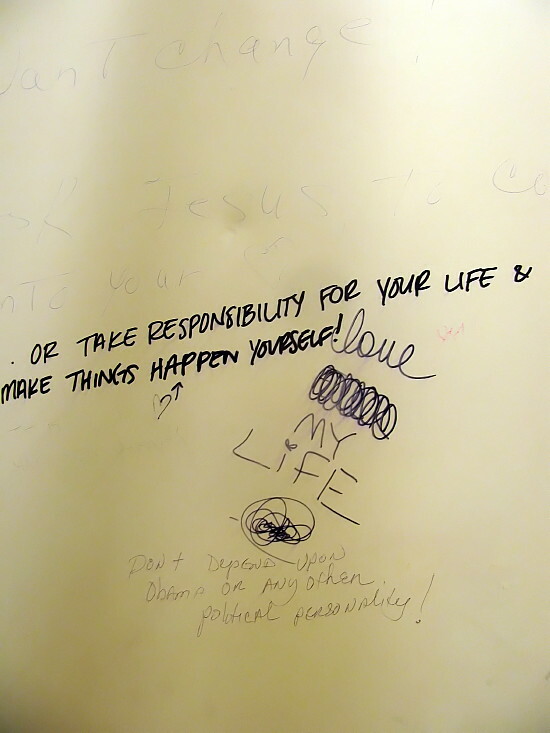 "OR TAKE RESPONSIBILITY FOR YOUR LIFE AND MAKE THINGS HAPPEN YOURSELF!" "love [something crossed out, possible "God"] MY LIFE"
"Don't depend on Obama or any other political personality!" "So you ask for it on a bathroom wall?!" "I needed an unbiased opinion"
Apparently the person no longer needs the advice. We don't get to find out what their dilemma was. Dump the boyfriend? Go back to school? We'll never know. 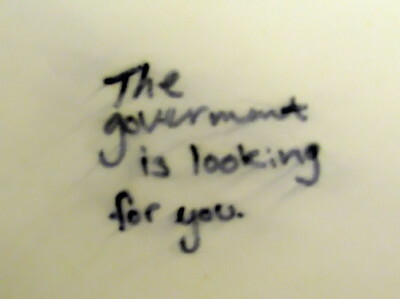 "The government is looking for you." It seems to me that I may have written on an already well-covered bathroom wall a few times in my life, most likely in Columbus Ohio when I was in my early 20s. I have no idea what I wrote, if anything. The one graffiti of mine that I remember almost-for-sure goes back even earlier. There was a tall silo or water tower at the edge of the farm adjacent to Fayetteville-Manlius High School when I was there from 1972 to 1975. (My junior high before that was in half of that same building.) The farm belonged to the man who moonlighted as the driver of my afternoon school bus. I've long since forgotten his name. The tower was, of course, covered with graffiti, mostly about how great the school and its sports teams were. For years I looked at that silo and had two conflicting impulses about it. On the one hand, I fundamentally didn't like the idea of defacing someone else's property. I considered it unethical. On the other hand, writing on that tower was clearly a school tradition, and one more note was not going to make much difference. In the end I decided to go up to that silo and write the word "HI" in the tiniest lettering I could manage. In pencil. I don't remember whether I ever actually committed this crime, or merely thought about it for a year or longer. But yes, I think graffiti can be really interesting, obviously. Sure, there's very little to be said for messages such as "JOHN + KAREN 4EVER!!!" or some bit of rudeness or crudeness. Not do I approve of "tagging," where the sole purpose is to leave your mark on someone else's property in six foot high letters and three colors of paint. But a discussion on a bathroom wall is a different story. That's pretty much a victimless crime, a momentary amusement and food for thought for whoever comes along and reads it. There is no Them. There is only Us. But what the heck. I don't need to write on a wall. I have a blog!